Because it’s not like you need to put any actual work into bringing the games over, amirite? This is why I don’t participate in the fandom part of fandoms. BLESS YOU, JESSICA! I could really use a break from all these GREE events, too. Sorry, Fedora Kaguya, but I’m not part of the “many” you speak of because I understand that Voltage games were originally targeted to Japanese women who live in Japan, not necessarily anyone and everyone who wanted to play their games all over the world. And can I make a point that Voltage Inc. DOES NOT BELIEVE WE CAN’T AFFORD THEIR GAMES. VOLTAGE INC. DOES NOT BELIEVE THAT ANYONE WHO ISN’T JAPANESE LIVING IN JAPAN CAN’T AFFORD THEIR GAMES. If that were the case, they wouldn’t even be bringing them over for the English speaking audience. I hardly think a company would risk sending something, much less everything they have, outside of their country and outside of their target audience if they didn’t believe it would sell. The obvious reason Japan has more games from Voltage Inc. than we do is because those games are still in original Japanese. If you’re so upset about it, then play the Japanese versions. 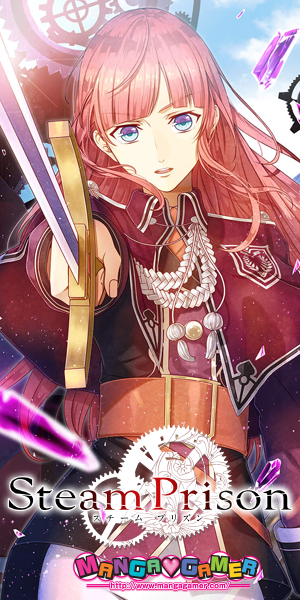 No one is stopping you from rooting your phone, downloading the Japanese versions, and buying the routes in Japanese. The only problem you’d come across from that is that rooting your phone might brick it, you’d need to know Japanese (or at least know how to type it into a translator), and be okay with paying in yen. Heck, there are other ways to bypass having your phone rooted and still be able to play the Japanese versions (for Android, I’m not so sure about iPhone). 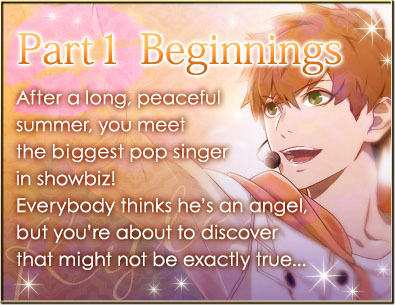 Voltage can’t just snap their fingers and have their games magically changed into English and work on non-Japanese phones. There’ s actual WORK and TIME that needs to be put into it. 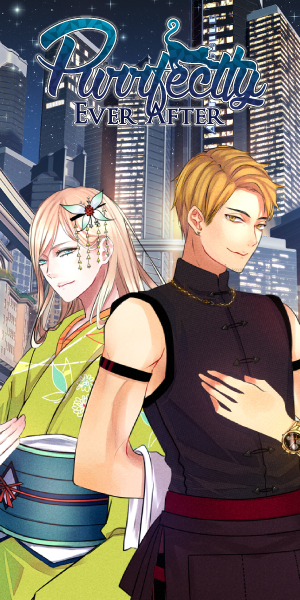 Voltage gets a bunch of complaints about how they’re so slow in releasing new updates and new games, and once one does come out, people are quick to point out the bugs and flaws. The faster that Voltage is rushed and pressured into releasing new content, the less time they have to fix any issues before it’s officially released. I CANNOT stand when someone complains to Voltage about their lack of updates, and once their anticipated update is released, they’re quick to criticize Voltage for their errors. THE SAME PERSON. I want new updates, new releases, and more bug fixes just as much as the next person, even despite how far behind on playing these games I am, but I’d rather wait longer for an update and release with as very few problems as possible as opposed to “GIVE ME GAME NAO” and have it chock-full of typos and errors. Another reason Japan has more Voltage games is because most of the games are made for Japanese feature phones. 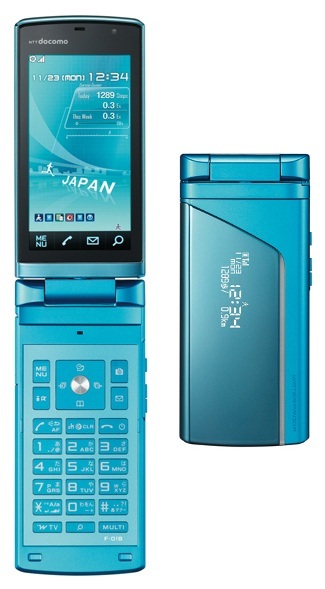 You can enjoy 『恋の続きはハネムーンで』 with the following handsets. 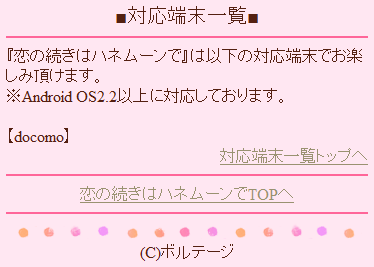 ※Compatible with Android OS2.2 and up. Not only that, but the feature phone versions on these games have a monthly fee. So instead of paying just ¥450 for each route in each game to keep and play whenever you want, you will pay ¥315 a month to play one chapter each day with no BGM or OP*. And for those wanting to know, ¥450 is the price for the main routes in the app versions of the games. At the current exchange rate (as of typing this), you’d be paying $4.96 for each route in the original Japanese version. Compared to the $3.99 for each main route in the English versions? I think I can wait. As for the feature phone versions, I don’t know how exactly it works when it comes to the months in between updates. I wouldn’t want to pay $3.47 a month for a game which I’ve already completed all the released routes and waiting for updates. Though I think the feature phone version gives you access to other goodies, so I would definitely consider paying for it if I was allowed to (and against the will of my weeping wallet). Then again, I’d also probably stick with the app versions, too, since the images are higher quality. 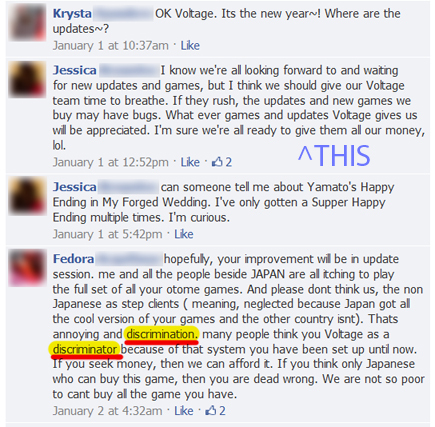 Anyways, Fedora Kaguya, I don’t think it looks good on you to post this on a post from Voltage showing their appreciation to their users and wishing them a very best New Year. Great way to show your thanks(?) 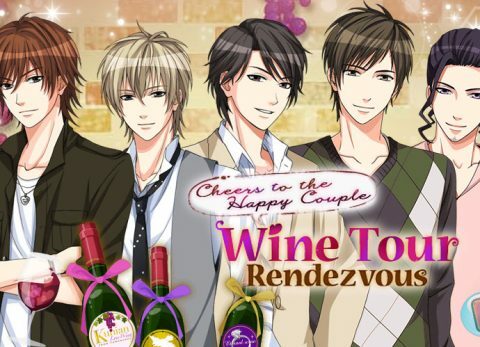 to one of the few companies that’s bringing us English speakers some Japanese otome games. I’m not trying to start a witch hunt here or anything, but my gosh. I understand the want for more releases and faster updates, but is there really a need to go to those types of lengths to get your point across? How about sending them a nice e-mail instead? Let them know how much you appreciate their hard work going into these English releases. Have a game in mind you’d like to see brought over? Kindly let them know that you’re interested in purchasing and playing that game. Have a sequel you’re itching to play? Let them know which character and in which game you’d like the update for. 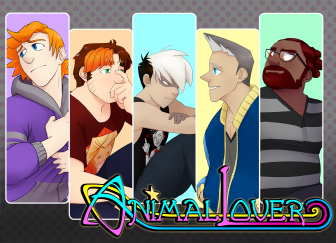 Want to play a certain spin-off? Let them know which one and in which game you want the update for. Don’t know what spin-offs there are but want one anyway? Let them know you want more spin-offs for which game. Let them know! You can even send them a message through the game app itself. (Open the app > Help > Answers to other questions > “Yes” to go to the Contact Us webpage > go to the very bottom under “2. Inquiries” and tap “here” (link) > fill out information and select Message Subject > Next > Ta-da! Type out your message. I have tried it in Pirates in Love and they have responded.) Here are the contact links for the currently released apps themselves if you can’t get to your phone. (Just make sure you put in your e-mail address in the inquiry forms, since it’s not being redirected from inside the apps). I’m pretty sure if you can take the time to write a rude and unappreciative message to them on Facebook (of all places! ), you can send them a kind and generous e-mail instead. There are ways to tell them your problems and issues that are really bothering you without sounding like a total jerk about it. If anything, I should be one of the last people to be talking about not raging at Voltage Inc., considering I do it a lot (most of my rants come from Be My Princess for GREE [event stuff like no breather time between events, not enough time period to fullcomp an event,… etc.] and the way a route plays out.) If anything, I rant about the same things in these games as the things I rant about in other types of media (anime, manga, TV shows, movies, etc.) except for the GREE thing. As much as I’ll rage about Voltage Inc., I am grateful enough for them that I am not going to bash them and be a jerk about it, and while I don’t expect any of the above types of comments to decrease, I just hope that people realize that Voltage can’t do anything and everything at the snap of a finger or a click of a button. Just have patience.